​YES, you can control blood sugar naturally. ​The purpose of this website is to expose the misconceptions, myths, deceptions and outright lies that the food processing, medical, pharmaceutical and "non-profit" industries have used for decades as propaganda regarding a fictional issue that they refer to as "Type 2 Diabetes." The fundamental issue in Diabetes Type 2 is that insulin levels are too high. Focusing on anything other than your elevated insulin levels only addresses the symptoms of the problem. THE PROBLEM IS ELEVATED INSULIN LEVELS, AND YOUR DOCTOR HAS PROBABLY NOT MEASURED YOUR INSULIN LEVELS. Have you experienced any (or all) of the symptoms listed above? Prior to reading these words, were you aware that the symptoms listed above can be caused by "hyperinsulinemia" or too much insulin in the blood? Has your doctor ever talked to you about "hyperinsulinemia?" Do you know what an optimal level of insulin in your blood would be? ​Has your doctor ever done a test to determine the levels of insulin in your blood? Your doctor should measure your INSULIN levels and warn you about the harmful effects of elevated insulin levels. ​Dr. Bernstein recommends that insulin levels be near 10 mIU/L. A blood glucose level is drawn before the test begins. A premeasured sugary drink is then given, and the blood glucose level is checked again in two hours. ​INJECT EVEN MORE INSULIN ! ​WATCH ALL 14 VIDEOS BELOW. ​This is the same video playlist as the one at the top of this page. Most people don't watch all the videos. WATCH ALL 14 VIDEOS IN THE PLAYLIST. It is vitally important that you counteract decades of misinformation. If you believe the propaganda that is continually being spread by the food processing, medical, pharmaceutical and "non-profit advocate group" industries then you are likely to remain unhealthy. If you take the time to learn about a true solution that will help to ELIMINATE AND REVERSE DIABETES, then you will be able to regain your health. 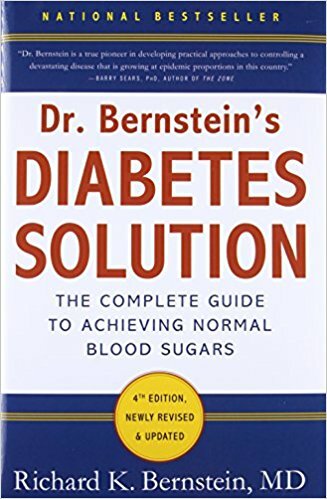 Dr. Bernstein's book is simply a must read for everyone who is dealing with "diabetes." CLICK HERE for access to a number of other good books. to choose from a number of individual herbs that can help you control blood sugar naturally. to choose from a number of herbal formulas that can help you control blood sugar naturally. to choose a high quality mineral supplement. ​​Examine your home's food supply. Clear off your kitchen table. Divide your table into three sections: One section for protein, one for fat and a third section for carbohydrates. ​Empty out your refrigerator, cupboards and pantry and place each food in its appropriate section on your table. 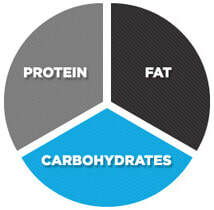 Divide your foods into three categories (protein, fat and carbs). 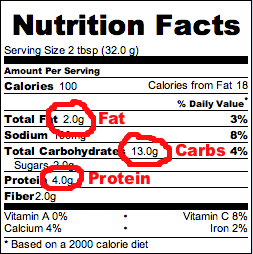 ​Look at the three main categories on the Nutrition Facts label. If the amount of grams of carbohydrates is the largest number, then place that food in the carbohydrate section on your table. Do the same for foods that are primarily fat or protein. ​Where does most of the sugar in your blood come from? It comes from the food you eat. The volume of food that you have in your home in each category should be roughly equal. Are they? Most people are amazed to discover just how out of balance their shopping habits are. It is very likely that the vast majority of the food that you have in your home is carbohydrate. ​If you are like most people, you will have discovered in STEP #5 that you have way too much carbohydrate in your food supply. If you are like most people, you will need to go to the store and purchase additional protein and fat in order to balance out the macronutrient content of your home's food supply. 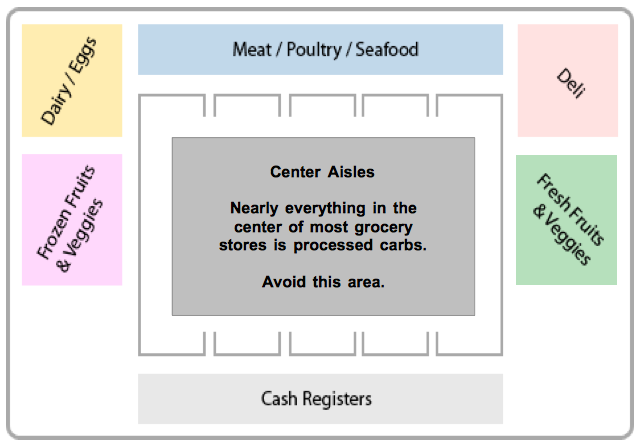 Shop mostly around the perimeter of the grocery store and avoid the center aisles. ​Eat a macronutrient balanced diet that provides 75 grams of protein 75 grams of fat and 75 grams of carbohydrates each day. NOTE: This diet is based on macroNUTRIENTS. This is NOT a macrobiotic diet. A "balanced diet" begins with a balanced amount of the three main macronutrients. As a basic guideline, eat approximately 75 grams of protein, 75 grams of fat and 75 grams of carbohydrate each day. Depending on your specific needs, you may eat more or less, but it is important to maintain the overall balance. DO consume foods that provide beneficial bacteria (probiotics). AVOID processed foods, sugary beverages, starches and grains. DO NOT consume artificial sweeteners, preservatives, artificial flavors, colors and pesticides. ​NEVER eat more than 25 grams of carbs at any one time. High protein and fat (very low, or no carbs). DINNER: High fiber and fat (salad, greens, vegetables, berries and nuts with an abundance of healthy oils or fats). The reason most people are hungry at "lunch time" is because they either did not eat breakfast or they ate a breakfast that was primarily carbohydrates. When you eat a high protein and fat breakfast, you will NOT feel hungry at lunch time. Do not force yourself to eat at lunch time out of habit. Change your eating pattern. ​Get up. Get away from whatever you do most of the day. Go outside and take a BRIEF, BRISK WALK until you feel your head clear and your energy levels start to improve (about 5 minutes). DO NOT OVER EXERCISE. Stop before you get tired and take your increased level of energy back into your daily life. ...they told you that Type 2 diabetes cannot be cured. ...they never measured your insulin levels. ...they prescribed pharmaceutical drugs to lower your sugar levels. ...they prescribed insulin without first measuring your insulin levels. ...they prescribed statins or other cholesterol lowering drugs. ...they ignored your concerns about the side effects of prescription drugs. ...they failed to show you a study showing the safety of prescribing more than one drug. ...they failed to refer you to someone who could give you quality nutritional advice. ...they recommended that you follow the guidelines of the American Diabetes Society or the American Heart Association. ...they recommended a low fat diet. ...they told you that herbs, vitamins and minerals don't work.